There was a point in my writing career before which I had only one plan and that was to pen a mighty epic. This was my sole focus and to this end any and every idea that occurred to me was squeezed into a corner of the world I was building. Pirates, cowboys, angels; my main character would encounter them all. I am very pleased to say that I am past this point. Mostly. I think it was sometime during the last year when I realised that I had legitimate ideas beginning to flow from me. By legitimate I mean that they were substantial enough to be the seed for their own world. I was actually generating ideas worth writing their own stories about. I’m not sure if this was unlocked by my beginning to just write (this was the main lesson I took from the creative writing course that got me going: Just write) or maybe my reading certain stories caused me to change the way I viewed the world and how I could use it in my own writing. Perhaps it was something else entirely or some combination of the above. In any case, with the realisation that I had more than one story in my head and that I was going to be writing more than my one epic, I no longer had the need to include every good idea in that one story. Trying to blend such a hodgepodge of ideas together would no doubt have resulted in a story with multiple personality disorder; the monstrous many-headed hydra of mythology brought to life. And just like in the Greek myth it would no doubt be in need of a good slaying. Ideas should not be rushed. A good idea will still be good later and is best served by allowing it its own space to grow in good time. Patience is a virtue. I once gave a summary of my epic to Big Risa and at the time she said to me that there were two stories there and that I should separate them. While I kind of agree with her even now I’m loathe to strip it out. I may have found an alternative to that particular problem though; not an original solution but it may still be the right one. So now, rather than that singular focus, when I get a new idea I look to the many little baby hydras to see which of those I can graft the idea onto. Still, I suppose that is better than the one super hydra. Dear Lordy, you know what they say about needing a holiday from the holiday. I just got back home after two weeks adventuring in New Zealand and the list of tasks awaiting me is daunting. Over one hundred emails. One thousand plus photos to sort and then post to Facebook. Laundry. Also need to catch up on guitar, vegies and exercise. Most of that took a backseat to two Diana Wynne Jones books that I’ve been looking forward to reading; Castle in the Air and House of Many Ways. It just goes to show that I can only focus on one thing at a time. Once I start a good book I can’t get anything else done. All of this of course means that I’ve been neglecting my writing and my blog. It’s time to begin remedying that. I did get taken by the urge to write one night early in my holiday where I spent the evening scratching away in an empty Vietnamese restaurant in Auckland. But that was all. Many of us would be familiar with the jaw-dropping scenery of New Zealand featured in the Lord of the Rings movies. While I determinedly avoided LOTR tours, I did indulge in all manner of other wallet-burning activities. Caving, white water rafting, black water rafting, skydiving. Also a Milford Sound cruise, a Maori culture and hangi night, a geothermal tour. New Zealand may be the adventure capital of the world but it doesn’t come cheap. Ironically, two of the best experiences I had cost nothing. 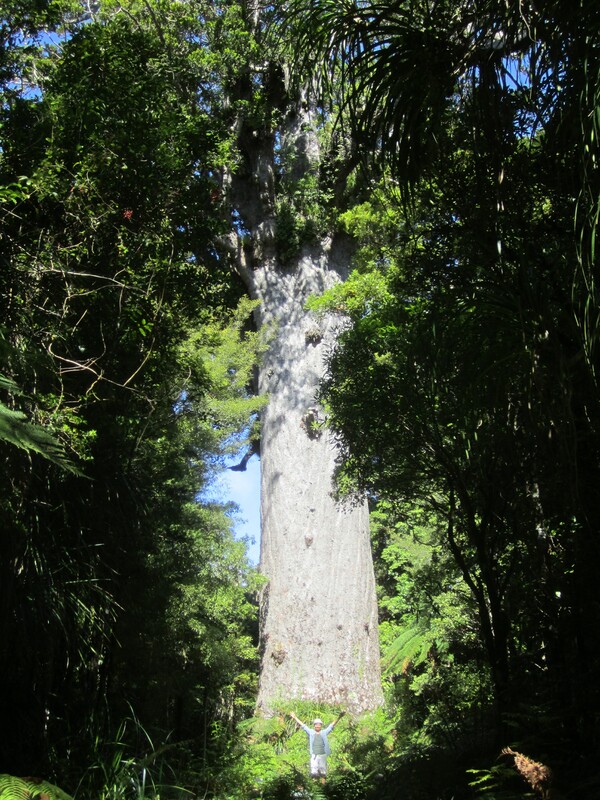 The first was witnessing the giant Kauri trees on the northern island. I say ‘witness’ because they really are a phenomenon you have to see firsthand to fully appreciate. That first glimpse of a wall of whiteness through the thin dark trees and the moment of realization that it was a single specimen, a god among trees, dwarfing all others into insignificance. Ten more metres along the forest path and I was presented with an unimpeded view that swiftly filled my mind with awe. Tāne Mahuta. Lord of the Forest. Estimated to be between 1,250 and 2,500 years old, its existence may very well stretch back to the time of Christ. Mind blowing. To simply be in its sunlit presence filled me with peace and an awe of nature. It’s no wonder that man would deify these giants of the forest. They now put me in mind of George R.R. Martins weirwoods; god trees that witnessed and remember all the doings of the small creatures that lived and passed away before their long lived eyes. 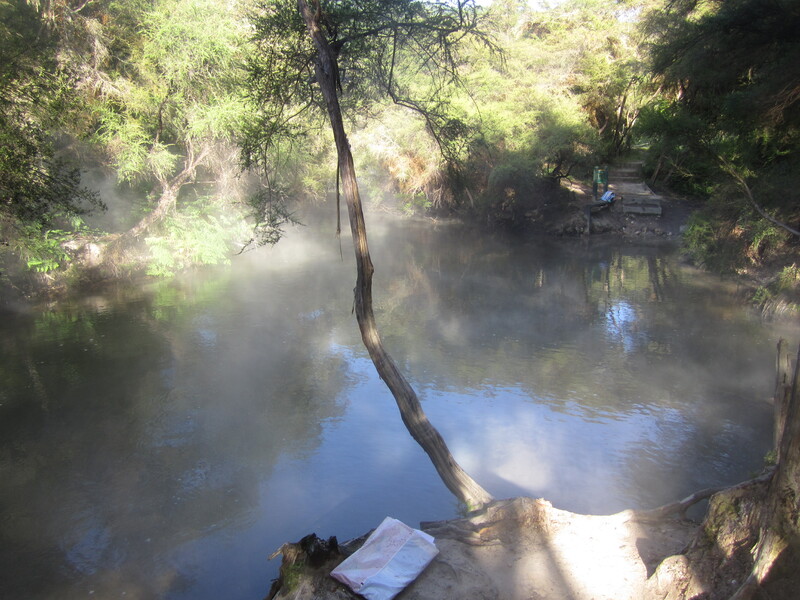 The second freebie was our visit to the Hot and Cold River in Rotorua. This area is famed for its geothermal activity and this particular river gets its name from the mix of hot and cold water making a wonderful (and free) place for a relaxing dip. The place is something of a local ‘secret’ that not too many tourists know of. Big Risa and I adventured out to the site after dark not knowing quite what to expect, only that the place was located twenty minutes out of town under a bridge. Sounds dodgy right? Fortunately there were other people enjoying the amenities and they had set up some tea candles amongst the rocks to provide mood lighting. With a few directions on how to get down to the water safely in the dark we were able to join in the fun of a night time dip and a relaxing soak. New Zealand is a gorgeous land, full of things to see and do. Perhaps it is missing the food to complete the holy triumvirate but I guess you can’t have it all. Hmmm that just got me thinking of a place that may just score the triple; my next holiday destination. But more on that later. New Zealand is a traveller’s paradise and the trip provided plenty of inspiration for me. Now to get to writing it!